We were discussing the various basic concepts such as Euler’s Equation of motion, Bernoulli’s equation from Euler’s equation, derivation of discharge through venturimeter, derivation of discharge through Orifice meter and Pitot tube with the expression of velocity of flow at any point in the pipe or channel, in the subject of fluid mechanics, in our recent posts. Today we will see here the resultant force exerted by flowing fluid on a pipe bend. 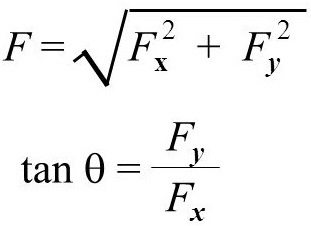 In order to secure the expression of resultant force exerted by a flowing fluid on a pipe bend, we will use the basic concept of impulse momentum equation. Before going ahead, it is very important to find out and read the concept of the momentum equation. Let us consider that fluid is flowing through a pipe which is bent as displayed here in following figure. We have considered here two sections i.e. section 1-1 and section 2-2. FX = Force exerted by the flowing fluid on the pipe bend in X-direction. FY = Force exerted by the flowing fluid on the pipe bend in Y-direction. As we have considered above that Fx and FY are the forces, exerted by the flowing fluid on the pipe bend in X and Y direction respectively. Considering the Newton’s third law of motion, forces exerted by the pipe bend on the flowing fluid will be - FX and - FY in X and Y direction respectively. There will be some other forces also acting on the flowing fluid. P1A1 and P2A2 are the pressure forces acting on the flowing fluid at section 1 and section 2 respectively. Now we will recall the momentum equation and we will have following equation for X direction. Similarly, we will recall the momentum equation and we will have following equation for Y direction. Let us determine the resultant force (FR) acting on pipe bend and angle bend by the resultant force (FR) with horizontal direction. We will now find out the "Moment of momentum equation", in the subject of fluid mechanics, in our next post.